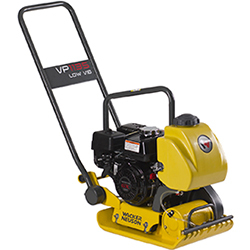 Wacker Neuson VP1135AW Vibratory Asphalt/Soil Plate, 11 kN, 35omm/14inch. Premium asphalt plates feature a durable baseplate for various applications. These premium vibratory asphalt plates feature a tough, wear resistant, ductile iron baseplate offering high strength and shock resistance. This computer designed baseplate has a tapered bottom and edges for high speed and excellent maneuverability. 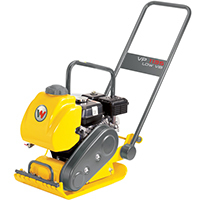 Designed for he compaction of granular and mixed materials with some cohesive content in confined areas such as parking lots, highway and bridge constructing, next to structures, curbs, and abutments. Completely enclosed belt protected by a lightweight belt guard for reduced wear and minimal service. Heavy-duty shock mounts on engine console dampen vibrations thereby reducing wear on the components. via centrifugal clutch and V-belt directly to exciter which transmits centrifugal force onto baseplate.